It has been scorching hot from past two weeks. We have been trying everything to cool ourselves.. from cold beer to soaking in the pool with cold water. And this is one of the recipe which is great to have on hot summer evening. It is appealing to both eyes and tummy. And the plus point is, its very very easy.. all you need is a melon scooper. Make sugar syrup by combining water and sugar and stirring over medium heat till sugar has dissolved. Keep aside and let it cool completely. Mix lemon juice. Check the sugar and put in the Refrigerator for later use. Cut the melons into half. Remove and discard the seeds. Now scoop out the melons with the help of a melon scooper. 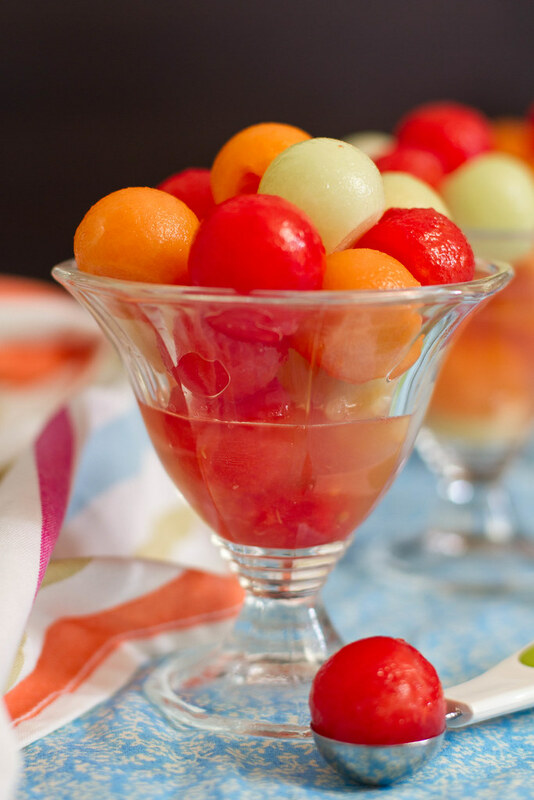 Place all the melon balls in a big bowl or box, cover and refrigerate. 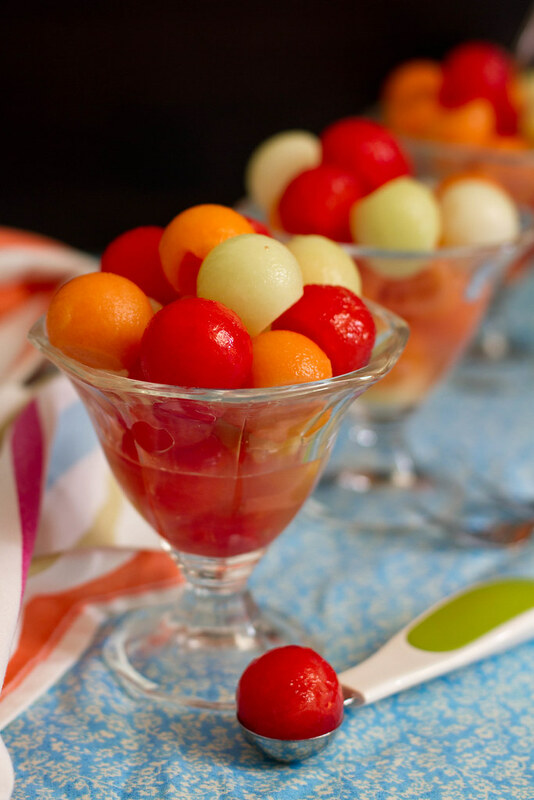 Ten or Fifteen minutes before serving, pour the prepared lemon juice over the melon balls and chill. Divide them into serving cups and serve cold. You can make the Lemon syrup one day ahead. You can replace the lemon juice with pineapple juice. Garnish with fresh mint leaves if you want. 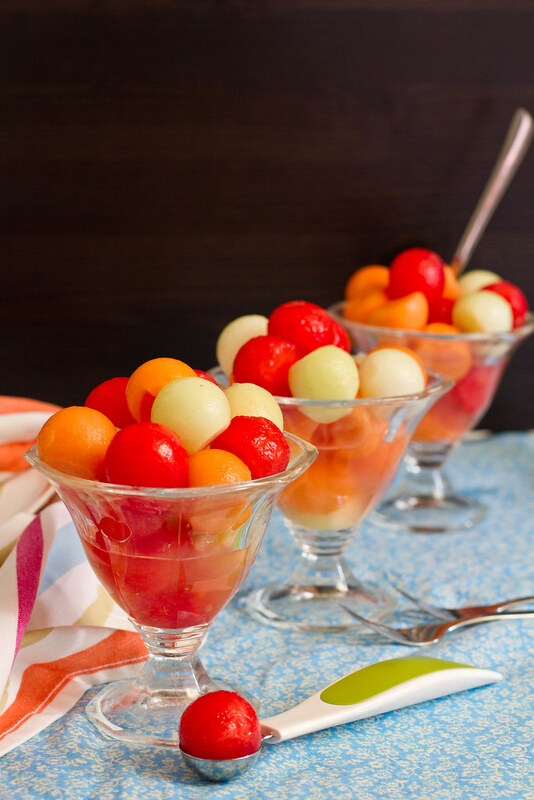 Gorgeous pictures and love those cute little melon scoops! Just proper presentation makes such a difference even in a simple dish doesnt it? 🙂 Loved the presentation here… so cheerful and appetizing!